Polyurea: This is the main coating. It is typically shipped in gallons or quarts. It is clear in color. Tint: Often labeled Pigment. This is a one quart can of ‘color’ that when added to one gallon of Polyurea and mixed with a drill mixer, yields the product for the ‘color coat’. Color Coat: This is the initial base coat and sometimes a second coat. It consists of the Polyurea mixed with the tint. Some systems use one color coat. Some systems use two. Clear Coat: A coat of polyurea done with no tint. Typically performed over a color coat. Some customers will simply do two clear coats for an industrial look. Flake: ‘Paint Chips’ that are added to epoxy and polyurea systems to add texture and color. The general application method is to broadcast the Flake into to colored “tinted” color coat. 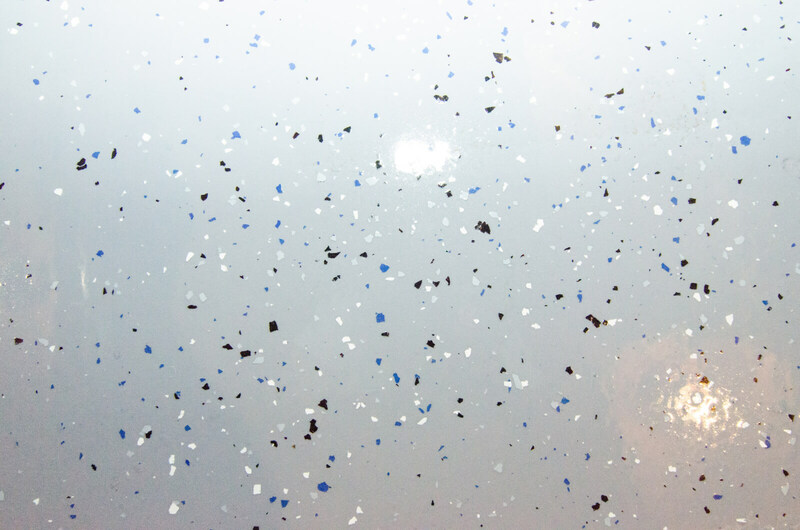 System: We define a system as a combination of the necessary color coat(s), clear coat(s) and flake. Specific examples below. Two Coat System: A Polyurea kit that includes enough material for a single coat of color and a single coat of clear. In this system the flake are broadcast into the first and only color coat. Three Coat System: A Polyurea kit that includes enough material for two color coats and a single coat of clear. In this system the flakes are broadcast into the second color coat. The exception would be if the customer chooses to install one color coat and two clear coats. Full Broadcast System: One coat of color completely covered in flake. Two coats of clear. Broadcast: Two meanings. First the type of flake system as discussed below. Second the method of applying flake. They are applied by hand, tossing in an upward motion. That process is referred to as broadcasting the flake. Random Broadcast: A coating system where both the polyurea and the flake are visible. Our kits include 1 pound of flake Per 100 Sq. Ft. You may use less as desired, but we do not suggest using more. Full Broadcast: A coating system where flakes are broadcast into the polyurea until no more flakes will stick. Also referred to as broadcasting to rejection. When properly done you should not see the Polyurea coat at all. Coverage: Typically expressed in a range, this is literally how far to spread a gallon of material. Coverage is never determined by sight or feel. If the coverage rate or spread rate is 200 Sq. 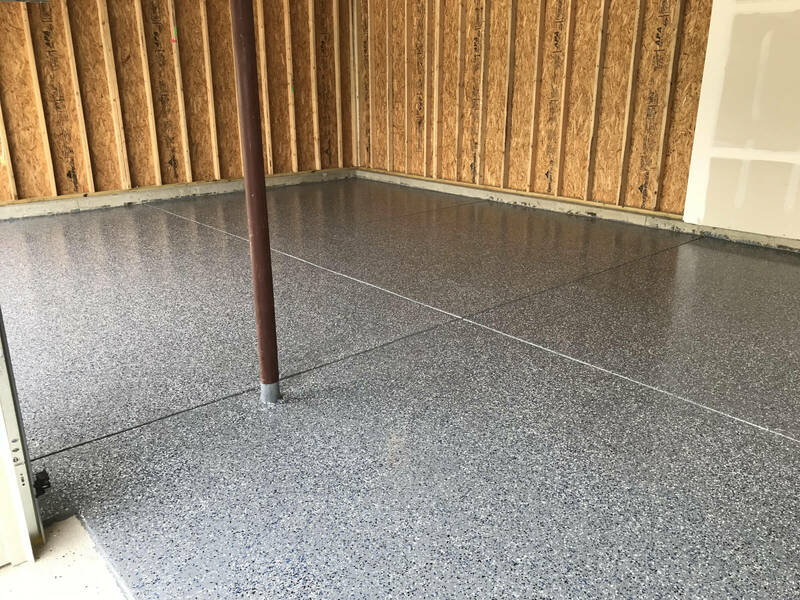 Ft. per gallon, you will spread one gallon of Polyurea over 200 Square feet EVEN if it looks or feels too thick or too thin. Square Foot: A 12″ x 12″ area. Multiple 12″ x 12″ areas are expressed as Square Feet. A 20×20 area would be 400 Square Feet. Anti-Skid or Anti-Wear: A material added to the final clear coat to increase slip resistance and wear resistance. For this system it is a fine white powdery substance packaged in a translucent container with a white lid. Moisture: Moisture, in the context of concrete, does not necessarily mean visible water. Moisture content cannot be determined visually. An appropriate testing method must be used. Surface Profile / Concrete Surface Profile: Expressed as ‘CSP’. The higher the number the ‘rougher’ the surface. CSP2 would be rougher than CSP1. There are many images available online. Polyurea and tint for the color coat, along with flake in one pile. Polyurea for clear coat and anti-skid in another. Breaking the product out by coat also helps to make sure you understand how much of each product you are using in each coat. Polyurea kits use the same material for the base coat as the top coat/clear coat. The only difference is you add tint for the base coat. You may receive more tint and anti-wear/anti-skid than you need. DO NOT just use all of it. Tint always comes prepackaged for a 1-gallon container. If you have a quart that needs to be tinted use 5 fluid ounces of tint; 10 fl oz for a half gallon etc. Always mix tinted material before applying to the floor. It is suggested that tinted material be combined into a single pail or bucket for color consistency. A drill mixer is suggested. Add on Kits: In an effort to reduce costs, you may need to split a gallon. For example, if you need 1/2 gallon of clear and 1/2 gallon of color, we are sending a gallon. You would separate it and tint only half of it (1/2 gallon). The anti-wear amount is given as a range on the instructions. 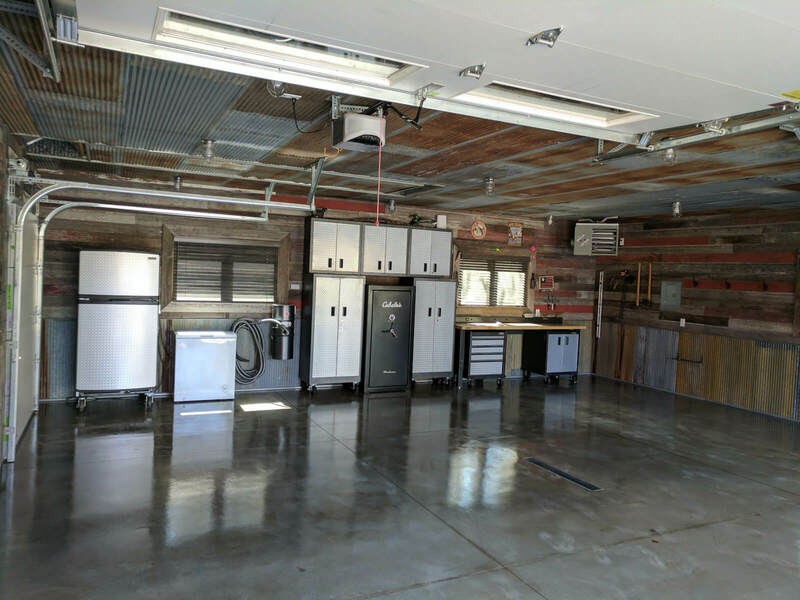 It is important that you consider the safety of those using the garage, the environmental conditions, and ease of cleaning, before deciding how much to use. We suggest using Midwest Rake 9″ 48203 3/8″ roller or 18″ 48209 3/8″ Roller. Change rollers every coat and every 400-500 square feet. These are available on our Polyurea page. Follow all safety precautions listed on the can. Work in a well-ventilated area during each step. Wear a NIOSH approved respirator, pants, long sleeves and gloves. Turn off any pilot lights and make sure no open flames are present during application. Make sure you have ventilation and maintain ventilation during the curing process. We are not saying you should leave your garage door wide open for three days, but some fresh air is necessary. As with all coating guidelines, these steps are not meant to substitute for common sense and actual field experience. It is not possible to discuss every situation. Please contact your distributor if you have additional questions. Instructions provided online may be updated more frequently than the print version. Always verify this information with the current installation instructions on our website. 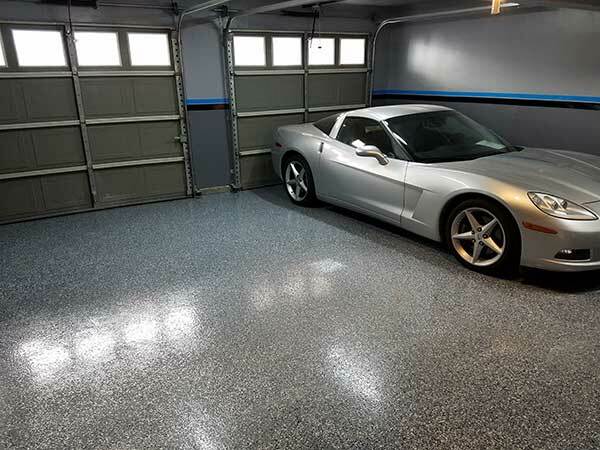 Base Coat: We suggest you estimate coverage based on 225 and 250 square feet per gallon. Our kits are designed for a thicker system. We use 200 sq. ft. per gallon spreading rate on all kits. Actual coverage, especially on subsequent coats, may be as high as 300 sq. ft. per gallon. Never exceed 300 sq. ft. per gallon. Just because you can spread it thinner does not mean you should. We highly suggest a spread rate of 200 sq. ft. per gallon for kits and up to 225 sq. ft. for individual purchase — See method A vs Method B for details. You are safe at 250 sq. ft. per gallon, especially on second coats BUT remember this product is three dimensional. The further you spread it, the thinner your floor coating will be. We cannot emphasize this point enough; Once you have determined how much material you will need per coat, use all of that material. You are not painting the floor. You are building a three-dimensional system. Failure to use all your material may result in system failure. This product requires a minimum of two coats total. One color coat and one clear coat. All installations must have at least one coat of clear, even if you are not using flake. Lighter colors such as white and porous or damaged concrete may require an extra color coat. Clear Coat: &nbspWe suggest two color coats and two clear coats for high use commercial, industrial and shop environments. Flake: &nbspRandom broadcast flake projects require between ¼ to 1 pound of flake per 100 square feet. 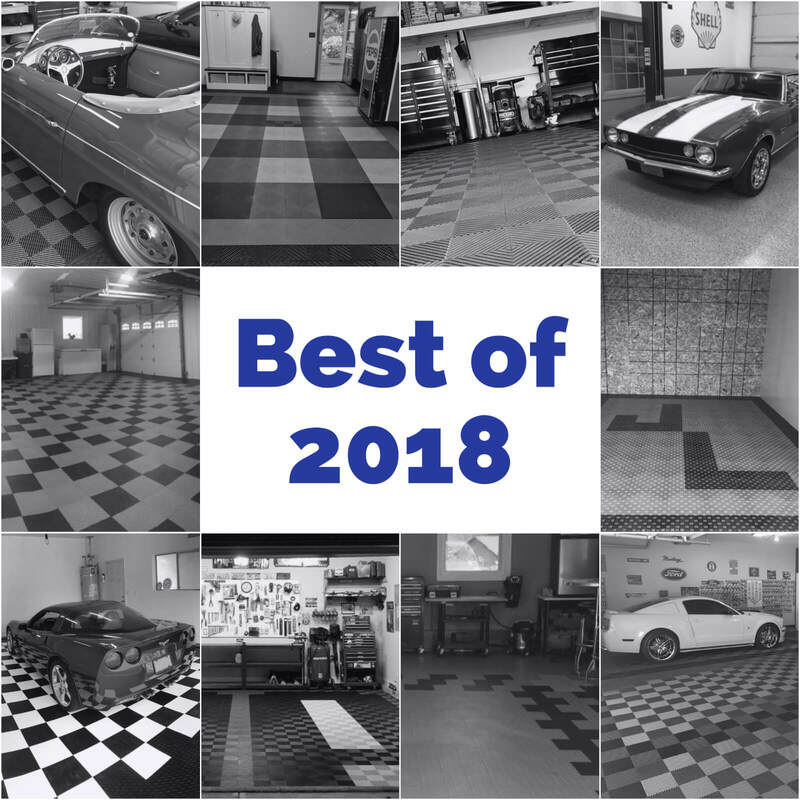 For full broadcast floors; divide the total square footage by 5 for DIY applications, or 6 for professional applications. A minimum of 2 coats of clear is required over a full broadcast floor. Anti-skid/Anti-wear: &nbspWe suggest ½ to 1 pound of our anti-wear anti-skid per gallon in the final coat. Based on our current packaging, a full container of anti-skid weighs 2 pounds. A half container will weigh 1 pound. Shelf life defines the total amount of time a product can sit on the shelf. Shelf life includes time spent in transit, time at the plant and time at distribution. We highly suggest using the product within 60 days of receipt. Store in temperature controlled environment in a well-sealed container. Do not allow to freeze. A moisture test is an important step with a coating. A plastic sheet test can be effective; however for warranty purposes, a calcium chloride test with results under 3 is suggested. 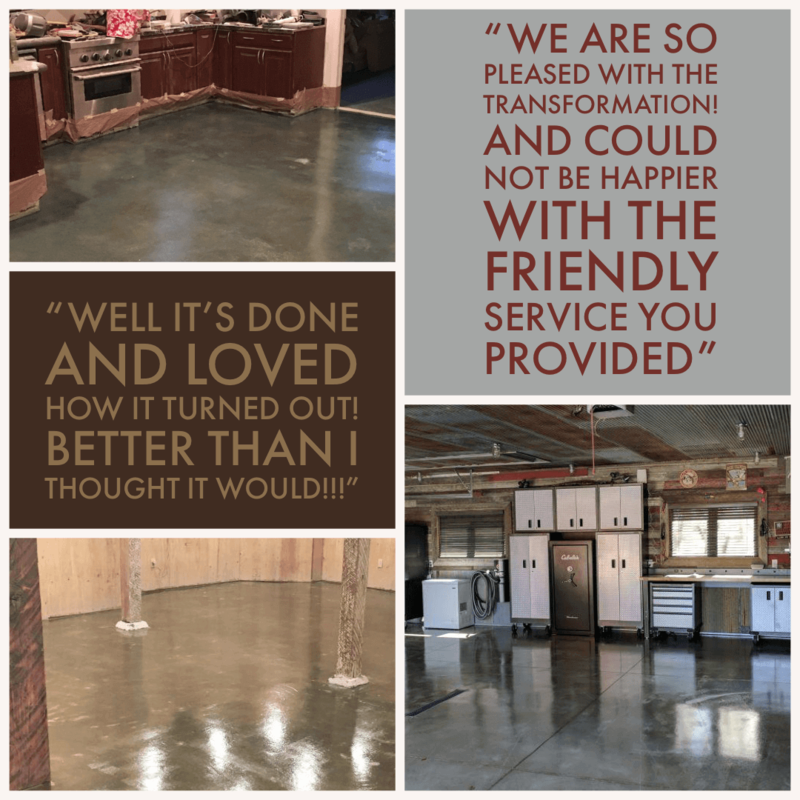 It is important that your concrete is free from oils, dirt, dust and other contaminants. We suggest All Weather Floors Industrial Cleaner. More stubborn oil stains may need to be removed using oil specific products. 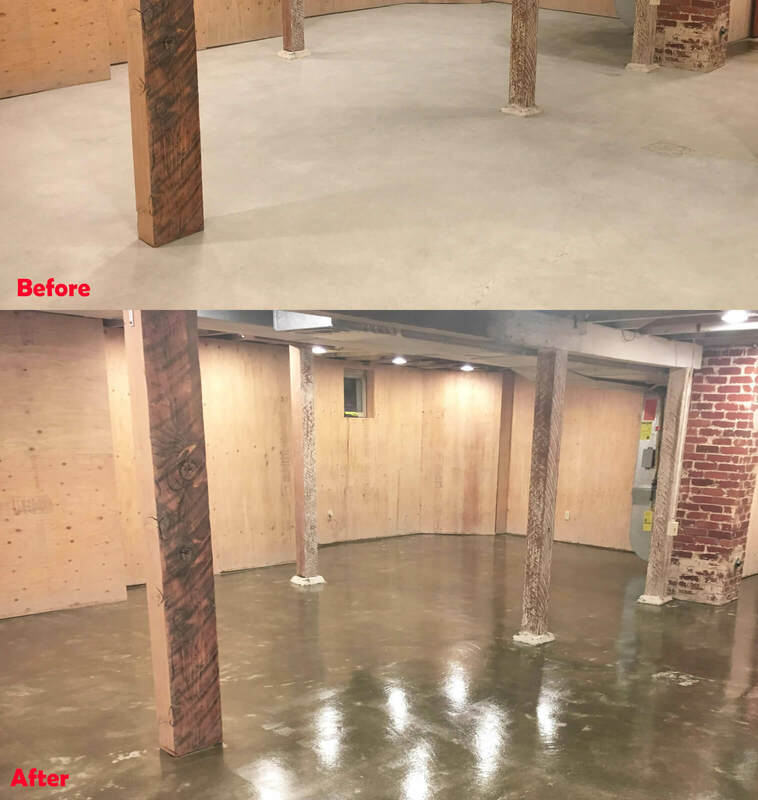 The objective of surface preparation is to provide a surface that the coating can bond to mechanically, meaning that the coating must soak into the concrete slightly to create a strong bond. A hard, smooth surface generally will not provide good adhesion, slightly porous, rough surfaces provide better adhesion. Acid Etch, Acid Stain (for clear), diamond grinding or shot blasting shall provide sufficient profile for proper adhesion. The desired surface profile is between CSP1 and CSP2. If acid etching, make sure you neutralize the acid and allow the floor to dry. If mechanical means are necessary, clean all dust. 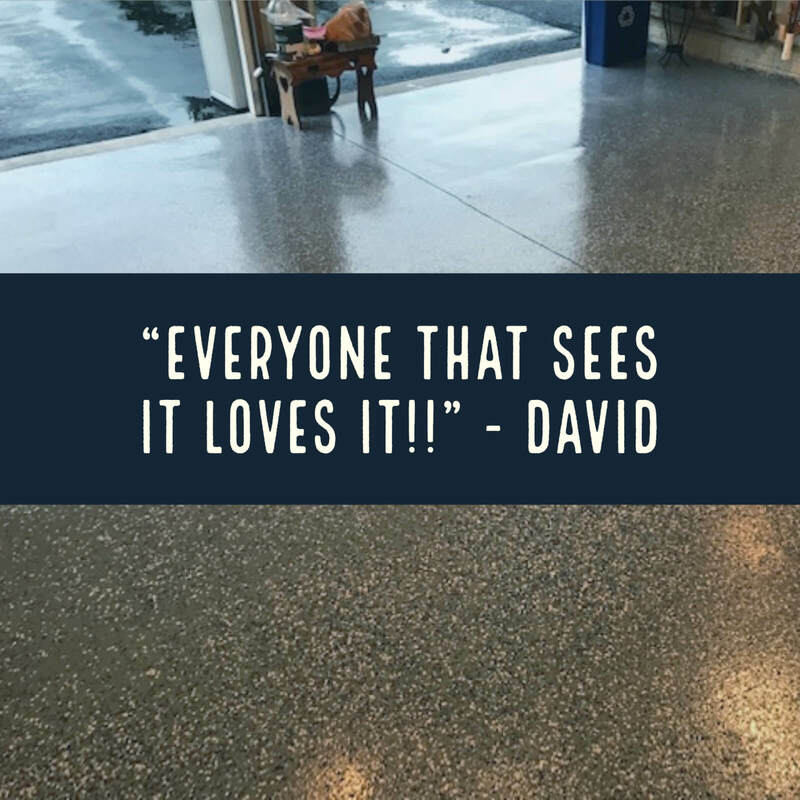 After etching or grinding it is important to make sure the floor is clean and free of oil stains, dust and other contaminants. A primer is always a good idea, but not required with this system. If a primer is desired, simply use an extra coat of our AWF 2K Polyurea. Please order additional material if this is desired. 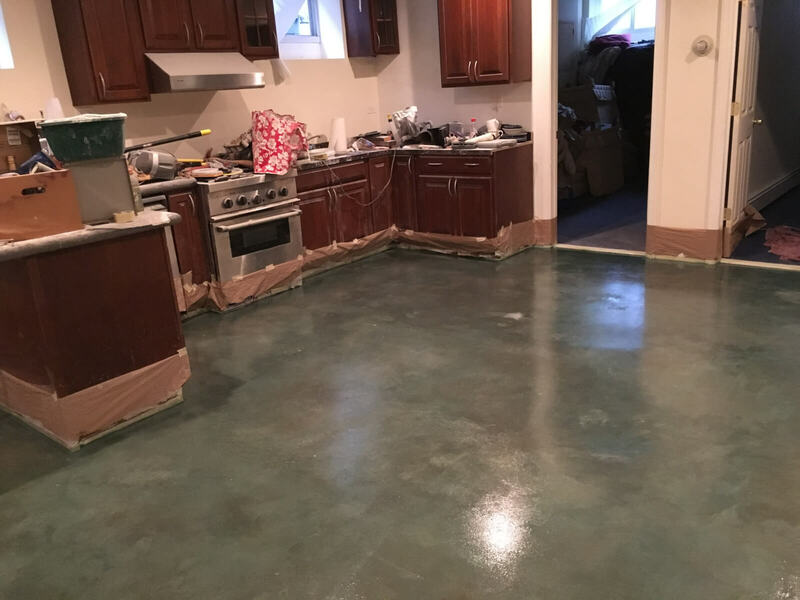 This is especially important with damaged or porous floors or in situations where the coating applied is lighter in color than the original concrete. Please follow the product application guidelines below. For all colors other than gray, we suggest two coats. The first coat essentially acts as a primer and makes sure your color is solid. 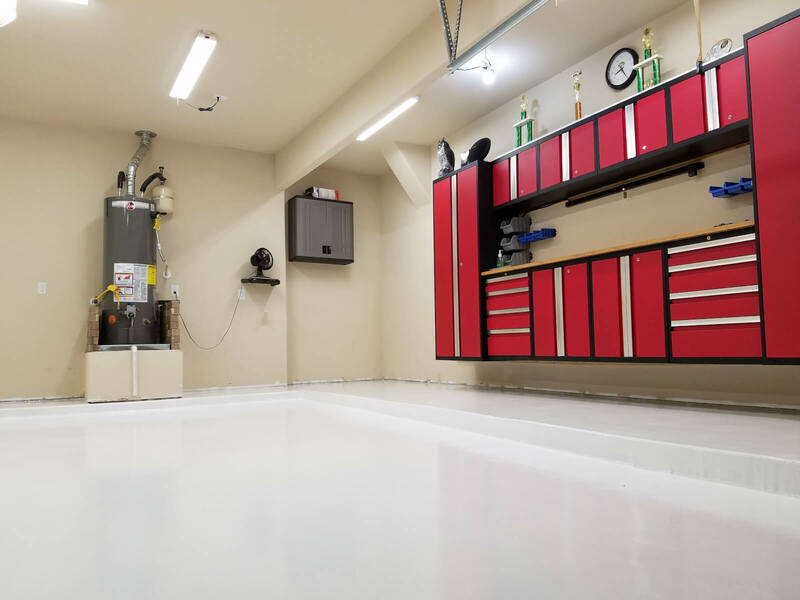 To accomplish a consistent color coat, it is important to prepare all the tinted amount needed for your project (for all coats) at one time, preferably in a single container. 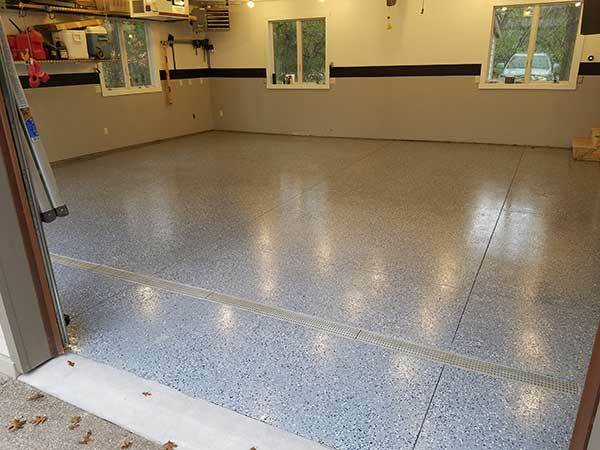 Typically this is accomplished by using a 5-gallon pail to combine the appropriate amount of polyurea for your color coat and the appropriate amount of tint. Mix product using a drill mixer set to low speed. Do not incorporate air into the mixture. We have two basic application methods. Both are sufficient. One will focus on getting more coverage — thereby reducing the price of the total system. The other focuses on getting the thickest, highest performing floor possible from the material purchased. Method A: For maximum coverage&nbsp — using a paint tray, wet your roller. Roll product onto the floor in small manageable areas and apply flake immediately. Do not allow the product to start to dry. Note: Flake is only installed in the final color coat. Use a solvent resistant chip brush to apply the product to any areas you cannot reach with a roller. You should achieve 225-250 sq. ft. per gallon coverage. DO NOT APPLY PRODUCT TOO THICK OR YOU WILL HAVE SOLVENT BUBBLING THAT WILL SHOW THROUGH YOUR FINAL COAT. Method B: For best performance: A spread rate of 200 sq. ft. / gallon produces a 5 Mil Dry Film thickness. A Mil is 1/1000th of an inch. Instead of the dip and roll method above, pour the appropriate amount of material on the floor in ribbons. Disperse it evenly based on the coverage rate. Spread it a 1/8″ notched squeegee or roller — then lightly back-roll. Allow 2-6 hours between coats of color or between color coat and clear coat. Again, please note, flake instructions should only be followed in your last coat of color. NEVER exceed 20 hours between coats. The next coat should be finished within 20 hours of starting the previous coat. If 20 hours is exceeded, you will need to sand, vacuum, solvent wipe and drywipe your floor. Repeat steps necessary. Some systems will have multiple coats of clear or color. Before installing the clear coat, it is important to lightly scrape and remove any loose or angular flake. In a DIY application, this can be accomplished using the floor attachment of a shop vac. It is often best to cover the edges of the floor attachment with duct tape. A scraper can also be used with caution. You are not trying to tear the flake out of the coating. Just get what is already loose. 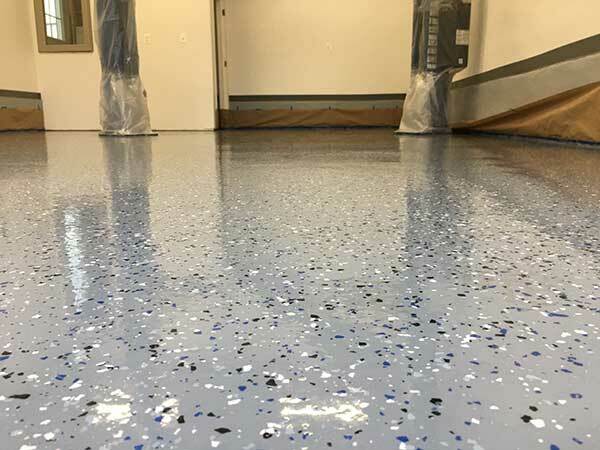 For FULL BROADCAST systems, as an optional extra step, running a floor buffer with fine sandpaper over the floor before coating with clear yields an incredibly smooth finished surface. Mix clear using a drill mixer. If this is your final coat of clear, mix in the anti-skid. This coat will be installed using two rollers. The first roller will be used just like in the color coat application. Using a paint tray, wet your roller. Because the clear is harder to see, we suggest indirect lighting and working in sections. Once you apply the clear to a section, roll over the section with the other (dry) roller. Do not apply any pressure to the dry roller. We suggest changing roller covers every 400 sq. ft. DO NOT APPLY PRODUCT TOO THICK OR YOU WILL HAVE SOLVENT BUBBLING THAT WILL SHOW THROUGH YOUR FINAL COAT. Please remember to add your anti-skid / anti-wear into your (final) clear coat. Make sure you add the anti-skid slowly to the bucket and mix continuously to avoid clumps or unequal distribution. We suggest waiting three full days at 70 degrees before driving on your floor — light foot traffic after 36 hours. THE PRODUCT MUST CURE FOR 72 HOURS. IF YOU LIVE IN AN AREA WHERE IT IS COLD AT NIGHT, DO NOT COUNT NIGHTTIME HOURS TOWARDS THE 72 HOURS. Time between coats is also impacted by cold temperatures.